Kingsoft PC Doctor is a free bunch of maintenance utilities and system protection, basically a good utility registry cleaner for Windows 8. 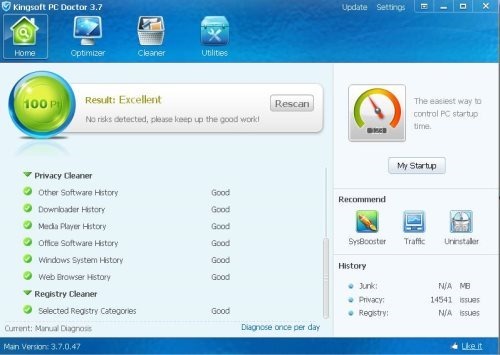 It also includes tools like junk cleaner, privacy cleaner, startup booster and registry cleaner. This free registry cleaner for Windows 8 efficiently cleans all the Windows traces and deeply optimizes your Windows 8 PC. It improves the speed and performance of your PC and removes all exposed threats from your PC. This free registry cleaner relies on powerful Kingsoft antivirus engine which enables you to detect and remove all malicious threats from your Windows 8 PC. It is also enabled with “One Key Optimizer” which makes your PC optimization quick and easy. Do not miss out our featured post on Best Windows 8 Software selected from the last’ week’s reviewed ones. Startup Booster– Boosts your PC from minutes to seconds by start-up and system optimization. It is extremely easy to use with one key optimization. Junk Cleaner-Cleans all Junk files on your PC, Removes music and video player cache. It also removes Web-browser and Windows system junk files. Privacy Cleaner– Removes all your local and online traces from your PC to protect your personal privacy. It removes Web-browser, Windows system, Media player, Downloader and other software history from your PC and remove all traces from your PC. Registry Cleaner- Cleans all selected registry files. Improves Your PC Performance– Cleans and optimizes your PC with traffic monitor and system booster. Increases the speed and performance of your Windows 8 PC. Get into the homepage to download Kingsoft PC Doctor to your Windows 8 PC. Yup! you are finished with installation. Kingsoft PC Doctor is an autonomous system optimizer to enhance your PCs potential by removing all junk files and selected registry files. Now, optimize your PCs performance with Kingsoft PC Doctor.